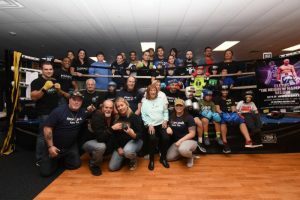 As has become his custom prior to each of his fights, Undefeated Long Island knockout artist Cletus “The Hebrew Hammer” Seldin, (20-0, 16 KO’s), held an open workout for fans and media at the Maximus Impact Boxing Gym in Riverhead, Long Island today. 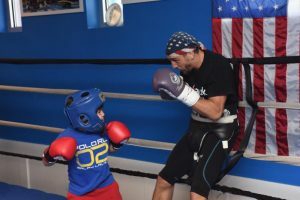 In addition to going through his workout for the media, Seldin also held a boxing clinic for kids who attended the workout, one of his last prior to facing Roberto “Massa” Ortiz, (35-1-2, 26 KO’s) next Saturday night, November 11 at NYBC LIVE, home of the Nassau Veterans Memorial Coliseum, as the TV opener on HBO World Championship Boxing. Seldin Vs. Ortiz is presented by Golden Boy Promotions in association with Joe DeGuardia’s Star Boxing. Seldin-Ortiz is the opening TV bout on the HBO triple header featuring Jacobs Vs. Arias. Jacobs Vs. Arias and Miller Vs. Wach are presented by Matchroom Boxing USA, in association with Brooklyn Sports & Entertainment, Salita Promotions and Roc Nation Sports. The event takes place Saturday, November 11 at NYCB LIVE, home of the Nassau Veterans Memorial Coliseum and will be televised live on HBO World Championship Boxing beginning at 10:00 p.m. ET/PT. BROOKLYN BOXING on Long Island is an extension of BSE’s BROOKLYN BOXING™ brand. For more information, visit brooklynboxingshop.com.